The exhibition at Kunsthaus Pasquart brings together for the first time a comprehensive overview of Melanie Manchot’s (*1966, D) series Mountainworks which responds to the landscape, community and tourism-led economic infrastructure of the Swiss village of Engelberg. The production over ten years of both photographic and moving image works, framed by this valley, can be understood as a sustained enquiry into our complex relationship with mountains as spaces of real and imaginary exploration of our place in the world. 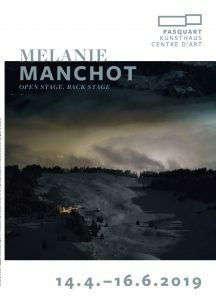 Arising from her interest in the ways we look after the places temporarily in our care, Manchot focuses on the «back stage» and the hidden labour necessary to make mountain industry function. The video trilogy Out of Bounds (2016) follows two different groups of men whose daily work on the mountain allows tourism to function. 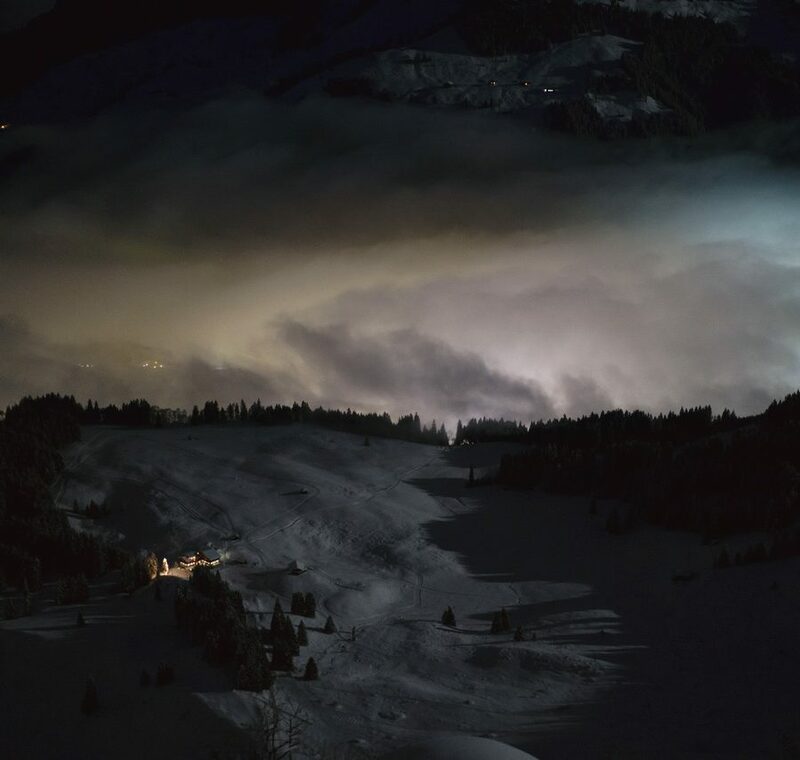 “A” shows a team that goes up early in the mornings after a fresh snowfall to detonate controlled avalanches, while “B” and “C” record the repetitive movements of piste-bully drivers who flatten the snow at night, creating a mysterious drama of mountainside and machinery. Manchot’s earliest Engelberg work, Leap after The Great Ecstasy (2011) brings together sportspeople, experts and maintenance staff on the grounds of the world’s largest natural ski jump. It charts the intense preparations for the event, both in terms of the physicality of the site itself and the individuals involved. The film’s climax (the jump) is, however, not shown. A situation thus arises of continual preparatory work and a focus on the artificiality of the spectacle. Cadence (2018) is one of Manchot’s most recent video works: from an aerial viewpoint we see a dark horse being led into a blank snowy landscape. Walking in a circle, it inscribes a trail of footprints in the snow, creating a kind of drawing. The scene is formal yet by means of the reduced visual language it places notions of nature and human agency in a state of suspense. At the same time, it echoes Manchot’s wider video and film works, in which choreography, dance, film and visual art are in dialogue. In the series White Light Black Snow (2017 ongoing) the artist questions the material qualities and conditions of the colour white. In examining the ability of the camera to «see» and to «reproduce» snow and ice, is concerned ultimately with the medium of photography itself. Manchot’s latest work Alpine Diskomiks (2019) arranges the convergence of image and sound, similar to a tectonic shift of land masses, and unfolds a continuous panorama of a mountain chain from the covers of 50 records, all of them showing the image of a mountain. An accumulation of sound that increases and reduces sequentially allows us to experience the drama and the forces of the continual process of accumulation and erosion in the mountains. The music in this incongruous collection spans the entire spectrum from classical to folk, techno to death metal. themes are equally evident in one of her most ambitious performative works, Dance (All Night, London) (2017), presented as a large-scale video installation in the Salle Poma. For an entire night Manchot brought together a variety of movements and cultures by working with dance schools based in London’s East End, each of which represented a different style of dance. In the course of the night the place transformed into a social space, formed by the dynamic of various gestures and movements which co-existed through a multitude of rhythms. The work questions the potential for variety, difference and collective belonging in the context of our increasingly complex societies. A new version of this collective dance performance will be performed live in the old town of Biel on 25 May 2019 in collaboration with nearly all Biel’s dance organisations. The film of the event will be presented at a later date at Kunsthaus Pasquart. On the occasion of Melanie Manchot’s exhibitions at the Musée d’art contemporain du Val-de-Marne (20.10.2018-24.2.2019) and at Kunsthaus Pasquart (14.4.-16.6.2019) the publication Open Ended Now was published, with texts by Fabienne Brugère & Guillaume le Blanc, Kate Bush, Maeve Connolly, Florian Gaité, Frank Lamy, Sibylle Omlin and Ellen Mara De Wachter (DT / FR / ENG). Edited by MAC VAL and Kunsthaus Pasquart, ca. 100 illustrations, 244 pages, hardcover, 2018. Thurs 23.5.2019, 6pm (dt) Melanie Manchot in conversation with Felicity Lunn. You are cordially invited to accompany the Biel dance groups brought together by Melanie Manchot on their procession-like route through the old town of Biel.